NST Reviews: AVATAR: AN ASTOUNDING MIND JOB! When James Cameron accepted his Best Director Oscar for Titanic, he'd declared, "I am the king of the world!" That was eleven years ago! Many writers and critics everywhere were shocked by his hubris. I had absolutely no problem with what he said. I loved his Terminator films, Aliens and, of course, Titanic. Never mind that his The Abyss was abysmal! He was a consummate filmmaker whose mastery of the technical aspects of making a film and storytelling expertise were second to none as far as I was concerned. And, now, more than a decade after disappearing from the silver screen, he is back with Avatar. All I can say is that, he has crafted a spellbinding film that works at so many levels that this is THE definitive event movie in a long, long time. As all gamer boys and girls would already know by now, avatar in computer gamers' parlance roughly means a human player inhabiting the virtual shell of fantastical characters in computer games, role-palying anything from soldiers to warriors and sorcerers. Of course, this being a James Cameron film, the director takes the whole virtual reincarnation game play to a whole new level. 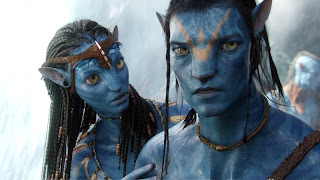 The film is about Jake Sully (Sam Worthington), a soldier who has lost the use of his legs and, as fate would have it, ends up stepping into a world where he is recruited to explore another world in this futuristic sci-fi that blends live action and cutting-edge computer animation like you have never seen before. The world Jake explores is an alien world called Pandora, inhabited by 10-foot tall blue aliens called the Na'vi. Funding the human exploration initiative is a bunch of heartless capitalists (a common theme in Cameron's films, as reflected in Aliens) who are determined to exploit Pandora for a priceless mineral that it possesses. As the trailer for Avatar already made clear, a large mineral deposit is directly beneath the Hometree, an area that a group of these primitive but tough Na'vis call home. The "corporation" has already failed in its earlier negotiations (ploys which included offering colonialistic English lessons and the supply of medicines etc) with the blue natives to have them relocate so that the minerals can be mined for profit. These diplomatic dialogues, intriguingly, were initiated with the help of scientific experiments where Na'vi clones were merged with human DNA and these lab-created Na'vi "vessels" are "piloted" by humans via some super sophisticated neuron networking devices. The three Na'vi bodies used by the humans are the avatars and the humans feel, see and experience everything that their avatars go through. Besides Jake, Dr Grace Augustine (Sigourney Weaver) and Norm Spellman (Joel Moore) are two scientists who have Na'vi avatars. As is usual with corporations, time is money and time is exactly what they insists they do not have. These capitalists (represented by Giovanni Ribisi's Parker Selfridge) have guns for hire (led by Colonel Miles, played by Stephen Lang), and decide to take a hardline stance against the Na'vis reluctance to relocate. This being a James Cameron film, things are not as they seem. Through the Na'vi avatars, the human pilots see life from the Na'vi people's benign and nature-loving perspective. And Jake especially connects with them. But, before Jake reaches such a compassionate stage, as filmdom's dramatic device dictates, he is just a grunt for hire and in doing his soldierly duties, he feeds back intelligence to the corporation about whatever he learns about the Na'vi. Such information in the hands of the corporation, of course, spells doom for the alien species. Only thanks to the Na'vi-friendly Dr Grace's expert manoeuvering, Jake slowly begins to see and understand the fantastic relationship the Na'vis share with their land. Into this bowl, writer-director Cameron throws the ingredients that include an interspecies romance, the already mentioned ruthless colonel, the heartless capitalist, a compassionate scientist and a courageous hero, and he sets the Hollywood Kitchen Aid mixer on an "are-you-insane" spin, resulting in a volatile mix of action an adventure. Simply unforgettable stuff! The way the planet is organically linked is also impressive -- with roots of trees not only holding everything on and in the ground together but also stringing airborne chunks of Pandora's landmass in a state of connectedness. The special effects in Avatar, needless to say are out of this world. Things that you or I could never have imagined are depicted in realistic three dimensionality on the screen. The plants, the animals, the terrain -- everything is exceptionally done, rendered and delivered. And these are not offered as quick glimpses but fully orchestrated and visually satiating scenes and sequences. The way the story folds out is classic Cameron stuff: the premise is clearly laid out, the details are lucidly spelt out, the logic extremely sound and top quality performances are expertly harnessed from the actors. The multilayered-relevance of this film (it could be a parable for the American invasion of Iraq for oil and Colonel Miles could double up for the Blackwater guards, or to cast your minds back a few centuries earlier in human history, it even reflects the European invasion and annihilation of the South American civilisations hundreds of years ago) makes Avatar perfect and resonant for the time we live in now. Cameron poignantly delves into the many modes that the human mind works on: the desire for profit, the pursuit of materialsim, the need to defend the weak, the desire to be compassionate and maintain our humanity, the powerful intuitions to obey rules and to break rules. Worthington is stellar as a soulful man and Weaver is a delight to watch. My favourite actress Michelle Rodriguez gives a memorable performance, as usual. A visual wizard if there ever was one, the way Canada-born Cameron expertly alternates between reality and computer wizardry will come as no surprise to his ardent fans. His direction is flawless here. At the end of this amazing work of silverscreen magic and art, you wonder whether you were actually James Cameron's avatar? Or, was the movie your avatar?" It's not at all simplistic to simply happen to be giving away things that many many others might have been trying to sell. I actually wanted to compose a simple word to say thanks to you for all the stunning pointers you are giving out at this website. Este es un blog muy agradable e informativo. He buscado en muchos sitios, pero no pude obtener información como en su sitio. Realmente me gustan tus ideas. Si te gustan los juegos Friv,entonces ir a la página friv de juegos online gratis. ¡Gracias! I really love watching avatar movies; they are supernaturally beautiful and offer imaginary features that are out of this world. This is great. As a student that really loves to watch such movies, it’s very necessary to always make the most out of our services. With highly trained and professional analysts for hire, be sure that doing the analysis of data will no longer be a challenge. We will always offer the best analysis assignment help. Enjoy your movie as we take on your assignment.